No investment strategy has created more millionaires than real estate. Even in less-than-stellar economies, real estate offers a “”safe harbor”” to people wishing to make smart, low-risk investments. And now there’s a foolproof, step-by-step system even financial novices can use to achieve wealth and financial freedom. 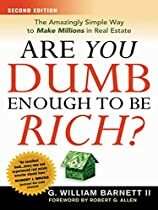 Are You Dumb Enough to Be Rich? gives people the resources and information they need to make serious amounts of money from buying and selling real estate. This essential book walks readers through the entire process, providing them with a 120-day plan for starting down the road to building real estate wealth. Too many real estate books focus on stories and unlikely examples about how other people became rich. Are You Dumb Enough to Be Rich? offers real strategies on finding the best opportunities, avoiding the common pitfalls of real estate investment, and building personal and professional credibility. Straightforward and easy-to-follow, the book empowers readers to take their first tentative steps toward real estate investing with confidence. Are You Dumb Enough to Be Rich? demonstrates that it doesn’t take a genius to make money — lots of it — in real estate.